Carbon-neutral date ideas for twitter-pated folks in springtime. 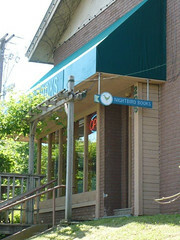 Be sure to check out Nightbird Books for both indoor, and outdoor, romantic spots! Dinner at Greenhouse Grille. We typically order their quinoa dishes. Riding the Bike Trail. We often look for bunnies on our ride. Walking at Wilson Park. Any park is great for a stroll hand-in-hand! Playing Pooh Sticks. Find a bridge, some sticks, and it’s a simple activity to do while talking. Exploring the Woods. We look for in-town woody spots, and find bird’s nests! Homemade Dinner with Candles. We usually cook organic, gluten-free spaghetti for dates. Game Nights! We sprawl out on the bedspread and play Zip-It or Scrabble.